An irregular rounded tree. 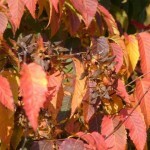 The bluish-green foliage turns to yellow, orange and red in the fall. The bark is a smooth steel gray. 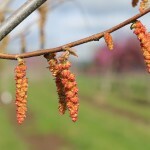 A good tree for naturalizing; it does well in shade or sun. It is native to riverbanks of the southeastern U.S. Other common names include Musclewood, Blue Beech, or Iron Wood.